Poor access to health and poverty go hand-in-hand. 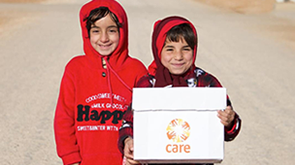 CARE fights poverty by improving the health of millions of the world’s poorest people, focusing on maternal and child health, and hygiene and sanitation – particularly increasing access for women and girls. We do this by increasing the capacity of healthcare services, strengthening systems to be responsive to the communities they serve as well as educating communities on health and hygiene information to increase both healthcare supply and demand. Our projects in these areas contribute towards the Sustainable Development Goals: SDG 3 – good health and well-being, and SDG 6 – clean water and sanitation.